While our Private Download Link enables you to share a private protected file with certain groups of people, track the number of clicks as well as expire its download links by clicks and date, our so-called “Shared Private Link” allows you to do much more than that. With shared private links, you can share your private file with all users of each preset user role using just a single link instead of an individual link per user as normal. Its download limit and expiry are also smartly applied to all users each role as well. Shared private links come in useful when you want to maintain the same product layout and download links across different users while still keeping track of for download limit and expiry for each of them. For example, upon sign up, editor A can download ebook E for 2 times then his download link expires. At the same time, editor B will be able to download ebook E twice only. Step 1: Go to “Media” and locate the file you want to generate a shared magic link then click on “Configure file protection”. Step 2: Once the file is protected (by clicking on “Protect this file” button), you will see Shared Private Link tab. For example, let’s set “editors” who can access this file with unlimited download limit (clicks). 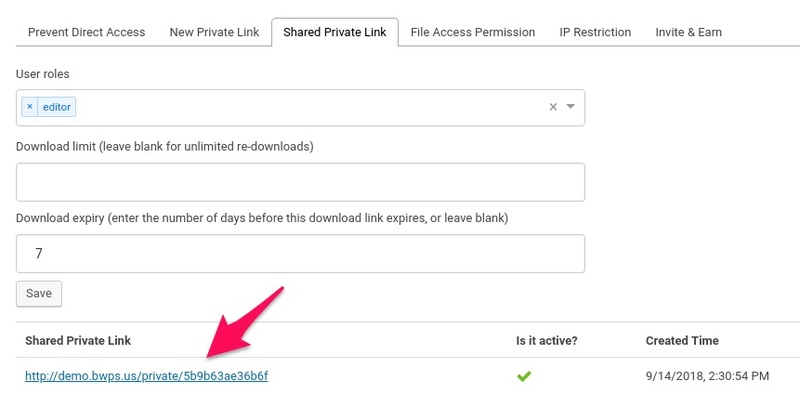 This download link will expire in 7 days’ time (from the first click of a user). Now you can copy and use it safely on your content such that unauthorized users will not be able to access it. To change download limit and expiry for this shared private link, just return to Shared Private Link tab and change the values. For instance, if you’re to change the Download limit to 2 (from unlimited clicks) and Download expiry to 9 (from 7 days). Editor A who had clicked the link twice will not be able to access it anymore. Editor B who had clicked once will have 1 click left and 9 days (from the day she first accessed it) to download the file. Editor C who has not accessed the file can still download it 2 more times (instead of unlimited). What’s more, you can also customize User Roles permission by adding new or removing existing user roles. For example, let’s give subscribers access permission to this file as well. Once done, all subscribers can download this file (using the shared private link) twice (2 clicks) within 9 days from the first download (just like Editor C in the above example). Please note that changing user roles permission will not affect the download limit and expiry of existing users.